I, too, have a cold, Dave. There is no sense as to why or when or where it came from or who shared it with me. I have laryngitis, a cough, a low grade temp, and absolutely no energy. 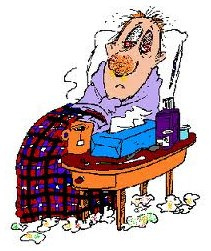 I agree colds at our age are just plain annoying. I would really like it to be over as soon as possible. I’ll still give you a poor baby. For one thing, you make a living with your melodious baritone and if you tried talking into microphones while sneezing and coughing…well. So poor baby. And on the other hand, enjoy some couch time. Hopin’ you feel better soon. Next Next post: That’s entertainment?